In the first quarter of 2018, Russia’s Gazprom supplied 797 million cubic meters of gas to Azerbaijan, according to a quarterly report of Gazprom. In 2017, Azerbaijan imported 349 million cubic meters of Russian gas. Previously, Gazprom Export LLC and Azerbaijan’s state oil company SOCAR agreed on resuming natural gas deliveries to Azerbaijan. The relevant contract was signed in Moscow on Nov. 21, 2017. The deliveries will be carried out starting from Nov. 22, 2017. Under the contract, it is planned to deliver 1.6 billion cubic meters of Russian gas to Azerbaijani market in general. SOCAR reported that the gas will be pumped into underground gas storages for its further use in processing, or for domestic needs. If there is a need, some volumes can be directed for export. These supplies will also allow SOCAR to check the capacity of its underground gas storage facilities. Earlier, Gazprom’s Board of Directors decided to open a representative office in Azerbaijan. There are two gas storage facilities – Kalmaz and Garadagh – in Azerbaijan. Capacity of Azerbaijan’s underground gas storage facilities allow to store more than 3.5 billion cubic meters of gas. In October 2009, Gazprom Export LLC and SOCAR signed a medium-term contract to deliver gas from Azerbaijan in 2010-2015 through the Shirvanovka point at the Russian-Azerbaijani border. 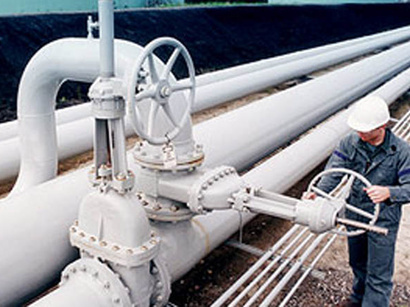 During the period, 5.4 billion cubic meters of Azerbaijani gas were bought. In 2015, a subsidiary of Gazprom Export LLC, Gazprom Schweiz AG, carried out deliveries to Azerbaijan Methanol Company (AzMeCo). Under the contract, 107.4 billion cubic meters of gas were delivered.